But we still want to hear from you! We have some folks lined up for the panel discussions, but we’d like to extend an invitation for more of you to serve on a panel discussion group. If you have great project ideas, thoughts on funding, really creative promotion ideas, or have been involved in Inasmuch United in your communities we’d like to hear from you and have you participate. 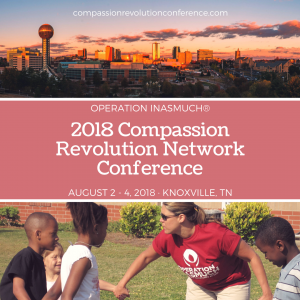 If you’d like to participate in one of these panel presentations during the break-out times you can email John Daugherty at john@operationinasmuch.org or call the office at 865.951.2511. John would enjoy hearing your stories and building good panels to inform and encourage others in our network of churches who use Inasmuch to impact their communities. Of course, we plan to celebrate and worship together under the leadership of musician and composer, Ken Medema, and keynote speaker, author and pastor, Rick Rusaw. In the meantime, we hope you are planning to be part of the first Compassion Revolution Network Conference. If your church has conducted Inasmuch Days or been part of Inasmuch United days, you are part of the network! That network is spread among 24 states in the US, plus congregations in the Philippines, Canada, Great Britain, and even Botswana. We believe there is much we can share and gain among our network churches and organizations. The conference is intended to be an opportunity to identify as part of the network, enjoy the kinship of serving through compassion ministry by serving the unserved, loving the unloved, and reaching the unchurched, in addition to exploring ways to strengthen and expand the network. Remember, you can keep up with us on Facebook at @OperationInasmuch, Twitter at @OpInasmuch, on the website, www.operationinasmuch.org. You can learn more and register for the Conference at www.compassionrevolutionconference.com. Hope to see you in Knoxville, August 2-4, 2018! And hope to learn from your experiences with Operation Inasmuch!